The re­lease notes ac­ci­den­tal­ly for­got to men­tion Gra­dle-less An­droid builds. That’s fixed now. Be­sides that, Hunter, Home­brew and Vcp­kg pack­ages for 2019.01 are now ready. While Mag­num sup­port­ed code hot-reload through its Plug­in­Man­ag­er li­brary from the very be­gin­ning, now there’s a new, much faster — but al­so more re­strict­ed — coun­ter­part to it. In the con­text of live cod­ing, 90% it­er­a­tions is done on the da­ta, fid­dling with val­ues un­til they feel right. Even wait­ing few sec­onds for code to re­com­pile af­ter each such it­er­a­tion is still very time-con­sum­ing and of­ten the process is abrupt­ly end­ed when the val­ue is “good enough”. So, what if we wouldn’t need to re­com­pile? Util­i­ty::Tweak­able is re­spon­si­ble for all the mag­ic shown in the above video and the gist of it is an abil­i­ty to up­date a run­ning ap­pli­ca­tion with con­stants from mod­i­fied source code — with­out re­com­pi­la­tion. The video al­so shows an ad­vanced IDE in­te­gra­tion with a col­or pick­er, how­ev­er the ba­sic ap­proach of code changes be­ing re­flect­ed im­me­di­ate­ly works with any ed­i­tor. This fea­ture is still very ex­per­i­men­tal, on the roadmap is a sup­port for hot code reload and tweak­able con­stants un­der Em­scripten and on An­droid, we al­so plan on re­leas­ing IDE in­te­gra­tion plug­ins sim­i­lar to the one above once they reach a more ma­ture state. HiD­PI-en­abled im­me­di­ate-mode GUI ren­der­ing us­ing the Dear ImGui li­brary. 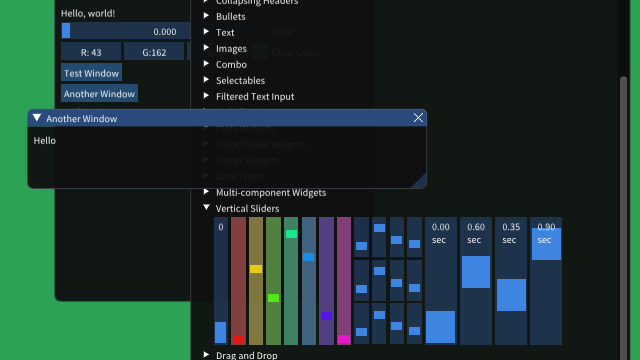 In­stead of hav­ing the Dear ImGui sources bun­dled with Mag­num, there’s a new Find­ImGui.cmake mod­ule that takes care of find­ing the sources and com­pil­ing them as part of ImGui­In­te­gra­tion. That gives you the pos­si­bil­i­ty of al­ways be­ing on ex­act­ly the ver­sion (or a fork) you need and the flex­i­bil­i­ty to bun­dle it your own way. Some pack­ag­ing sys­tems (such as Vcp­kg) pro­vide Dear ImGui as a li­brary, that’s sup­port­ed too. This func­tion­al­i­ty is cur­rent­ly ex­per­i­men­tal and very lim­it­ed, but it can save you sev­er­al sec­onds on each de­ploy com­pared to equiv­a­lent work­flow us­ing Gra­dle. See the very ex­ten­sive An­droid build­ing docs for more in­for­ma­tion. With Ubun­tu 14.04 go­ing away even on Travis CI, it was a time to say good­bye to com­pat­i­bil­i­ty with the old CMake 2.8.12. How­ev­er, ver­sion 3.0 had some is­sues with im­port­ed tar­gets, so the min­i­mal re­quired ver­sion is now 3.1. All suf­fi­cient­ly mod­ern Lin­ux dis­tri­bu­tions (ex­cept De­bian Jessie) are al­ready on ver­sions past 3.1, so this should not be a prob­lem — and if not, you can al­ways down­load and use an of­fi­cial CMake bi­na­ry on af­fect­ed sys­tems. While at it, sup­port for GCC 4.7 was dropped as well, since this is the last com­pil­er that didn’t sup­port rval­ue over­loads for this. Min­i­mal ver­sion is now 4.8.1, since 4.8 is still used on Cen­tOS 7 and we don’t want to pre­vent Mag­num from be­ing used on serv­er side as well. As far as C++ stan­dard goes, Mag­num is go­ing to stay on C++11 for the fore­see­able fu­ture. Ex­cept for ex­tend­ed constexpr, nei­ther C++14 nor C++17 of­fers any­thing that would lead to sig­nif­i­cant im­prove­ments on the li­brary side and the mi­nor ad­van­tages are not worth the com­pile time slow­downs due to in­crease in STL head­er bloat. How­ev­er, Mag­num is not for­bid­ding you to jump to new­er C++ stan­dards — if you need the re­cent fea­tures, feel free to use them. Speak­ing of STL head­er bloat, and not en­tire­ly un­re­lat­ed to the re­cent out­rage about “The State Of C++”, Mag­num is un­der­go­ing a gen­er­al up­date that aims for short­ened com­pile times and small­er bi­na­ry sizes, es­pe­cial­ly in We­bAssem­bly builds. Right now, this is main­ly about re­duc­ing the amount of STL in­cludes in head­ers and be­cause not all ba­si­cal­ly no STL con­tain­ers can be eas­i­ly for­ward-de­clared, it means re­plac­ing them with cus­tom al­ter­na­tives. As not all up­dates can be made in a back­wards-com­pat­i­ble way, the change is hap­pen­ing grad­u­al­ly — this re­lease re­places most us­es of std::unique_p­tr and std::ref­er­ence_wrap­per with Con­tain­ers::Point­er and Con­tain­ers::Ref­er­ence in or­der to avoid heavy <memory> and <functional> in­cludes and the work will con­tin­ue in fu­ture re­leas­es. While head­er bloat is not the on­ly thing con­tribut­ing to long com­pile times, it’s re­spon­si­ble for quite a large por­tion — and is thus al­so the “low hang­ing fruit” when it comes to com­pile time op­ti­miza­tions. There’s still a lot do in the Mag­num code­base and while re­mov­ing the de­pen­den­cy on <memory> and <functional> is cur­rent­ly not re­sult­ing in any sig­nif­i­cant com­pile-time speed up when build­ing Mag­num it­self, projects us­ing Mag­num re­port­ed com­pile times be­ing short­er by 20–30% as a re­sult of this change. As with all oth­er de­sign de­ci­sions in Mag­num, this doesn’t mean the en­gine will now un­con­di­tion­al­ly force you to use some alien types. In­stead, you have a choice — if you feel more com­fort­able us­ing stan­dard types, your team is not ready to learn yet an­oth­er API or you’re in­ter­act­ing with a 3rd par­ty lib that us­es them any­way, just keep us­ing them, the new Mag­num point­er and ref­er­ence types are im­plic­it­ly con­vert­ible to and from the STL equiv­a­lents. On the oth­er hand, if you re­al­ly care about your com­pile times and de­bug per­for­mance, the new types are for you — and you’re en­cour­aged to use them else­where as well, not just when in­ter­act­ing with Mag­num. More de­tails and rea­son­ing be­hind the new point­er and ref­er­ence types is pro­vid­ed in a ded­i­cat­ed ar­ti­cle. A re­lat­ed on­go­ing project, which is ba­si­cal­ly a side-prod­uct of the above “head­er di­et” work, is avail­abil­i­ty of var­i­ous Mag­num APIs as sin­gle-head­er li­braries — with a fo­cus on ease of in­te­gra­tion, fast com­pile times and small file sizes, while in­her­it­ing >99% test cov­er­age and ex­ten­sive doc­u­men­ta­tion that’s own to the Mag­num project it­self. Com­bin­ing all that is on­ly pos­si­ble be­cause the func­tion­al­i­ty is pri­mar­i­ly main­tained, doc­u­ment­ed and test­ed as part of Mag­num, where it can make use of all the in­fra­struc­ture and tool­ing. Se­lect­ed func­tion­al­i­ty is then ex­tract­ed via a script that strips it of com­ments, ver­bose doc­u­men­ta­tion blocks and rarely used func­tion­al­i­ty. The re­sult is a small self-con­tained file, how­ev­er still with the con­fi­dence of all code paths be­ing prop­er­ly test­ed and doc­u­ment­ed. More li­braries are to come as the head­er cleanup ad­vances fur­ther. The gen­er­al rule for ex­pos­ing a fea­ture as a sin­gle-head­er li­brary is how much it in­flates af­ter pre­pro­cess­ing — cur­rent­ly the soft up­per lim­it is 10k lines. For com­par­i­son, not even the <string> head­er fits in there, as it has 12k; on the oth­er hand I’m pret­ty con­fi­dent I can squeeze the whole Math li­brary un­der this lim­it. 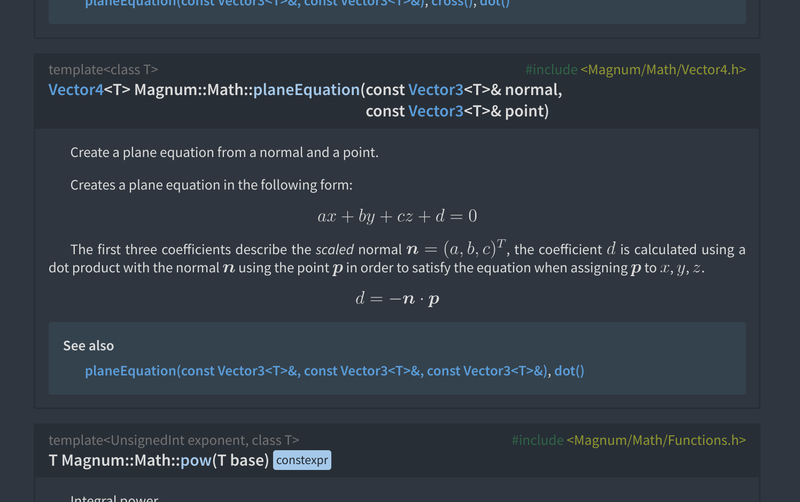 As an­oth­er small piece of the Vulkan puz­zle, the new Mag­num/Vk/In­te­gra­tion.h head­er pro­vides con­ver­sion be­tween ba­sic Vulkan types and their equiv­a­lents from the Math li­brary, to­geth­er with enum trans­la­tion con­tribut­ing to a smoother in­ter­ac­tion with raw Vulkan code. 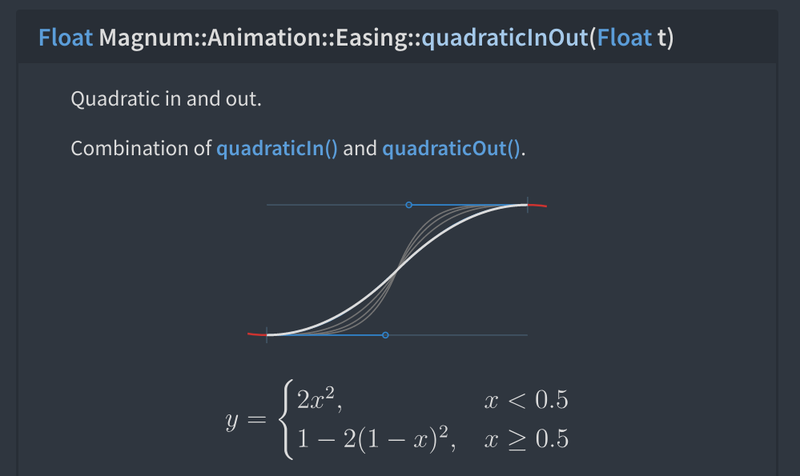 Since Mag­num now pro­vides math in­te­gra­tion for quite a few li­braries, in­clud­ing ImGui, there’s a full list pro­vid­ing de­tailed in­for­ma­tion about avail­able con­ver­sions for ev­ery third-par­ty API. The Mag­num doc­u­men­ta­tion re­ceived a larg­er up­date, main­ly re­lat­ed to search func­tion­al­i­ty. It’s now al­so show­ing the cor­re­spond­ing #include for each API — and that’s not just class­es, but al­so free func­tions, types and sin­gle-file names­paces. De­tails in this ar­ti­cle. Thanks to our ded­i­cat­ed com­mu­ni­ty, Cor­rade, Mag­num and Mag­num Plug­ins now have MSYS2 pack­ages. These are based off the Arch­Lin­ux PKGBUILDs (since both use pacman as the pack­age man­ag­er) and there’s both a in-source pack­age, build­ing the cur­rent­ly checked out work­ing tree; and a sta­ble one, down­load­ing a re­lease tar­ball. Apart from MSYS2, Mag­num is now avail­able in both Co­nan and Hunter pack­age man­agers. While Hunter is CMake-based and works di­rect­ly from in­side the CMake build di­rec­to­ry with­out any ad­di­tion­al de­pen­den­cies, Co­nan is buildsys­tem-in­de­pen­dent, but re­quires you to in­stall the Co­nan client first. Note that while Cor­rade for Co­nan is al­ready there, the Mag­num pack­age is still work-in-progress. Home­brew and Vcp­kg pack­ages are al­ready on the lat­est ver­sion, Arch­Lin­ux pack­ages are sched­uled to be up­dat­ed soon. In or­der to keep your code for­ward com­pat­i­ble, the rule should be to al­ways ex­plic­it­ly in­clude all types that you use in the par­tic­u­lar source file and not re­ly on the def­i­ni­tions be­ing present due to in­ter­nal en­gine head­er struc­ture. In prac­tice this is quite hard to achieve, on the oth­er hand due to the evolv­ing na­ture of the li­brary, there’s not much Mag­num it­self can do to pre­vent such break­ages. This ver­sion al­so starts to re­move APIs dep­re­cat­ed in 2018.02 (the first re­lease af­ter three years with­out sta­ble up­dates), mean­ing if you still have code­bas­es that are from be­fore this ver­sion, these will def­i­nite­ly not work any­more. The rec­om­mend­ed up­grade path is, as al­ways, go­ing through the sta­ble ver­sions one-by-one and fix­ing er­rors and dep­re­ca­tion warn­ings as they ap­pear — jump­ing straight to lat­est won’t be nowhere near a smooth up­grade ex­pe­ri­ence. For a com­plete over­view of new­ly dep­re­cat­ed fea­tures and pos­si­ble com­pat­i­bil­i­ty break­ages, check the changel­ogs list­ed be­low.